I can't say I enjoy the "hustle and bustle" of the holidays, so, being the masochist that I am, I inserted myself right into the middle of it all with a mid-December trip to New York. 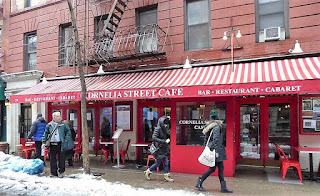 Our local radio station was sponsoring a bus trip to the Big Apple and I had my eye on a Greenwich Village food tasting tour, so I purchased tickets several weeks in advance. I do love travel, more than I hate crowds, I suppose. As for the winter weather, we've been quite lucky here in good old frosty Pennsylvania. Just last year, one snowstorm alone, (Jonas), dropped a total of 36 inches on us. 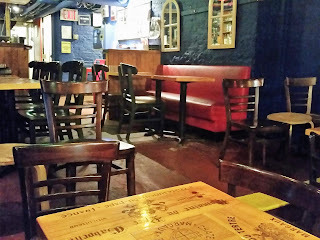 This year, we've enjoyed a bit of a reprieve, which lasted until the day of the tour. We learned 24-hours beforehand that an ice storm was nigh, and, for once, the forecasters were correct, but we stayed the course. My husband and I piled in the car around 5:00 a.m. and made our way carefully to the radio station studio, which was about 10 miles away. Roads had yet to be salted and snow fell steadily. Being half asleep has its merits; I only "overreacted" (according to my husband) once as we slid through a stop light. You can deduce that we made it in one piece by the fact that I'm writing this, but I have to say that the ride wasn't without its harrowing moments and we witnessed a few wrecks along the way. Thankfully, the rain stopped right before we pulled into the city. We did have to wade through deep puddles of slush here and there, so I have to give a shout out to the manufacturer of my boots--which kept my feet dry the entire time. Thanks to Patrizia for a well-made, waterproof, comfortable pair of footwear. 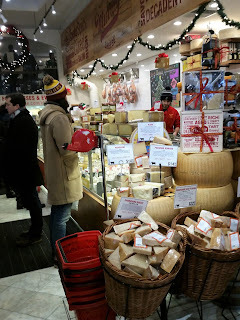 We met our guide at Murray's Cheese and Gourmet Foods located on Bleecker Street. 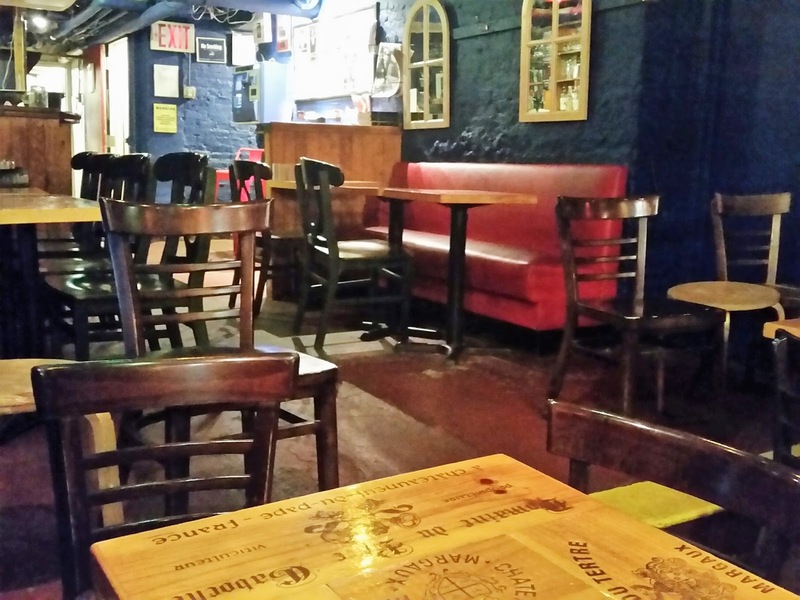 The family-owned establishment was founded in 1940, by Murray Greenburg, a Jewish veteran of the Spanish Civil War. Murray later sold the business to his clerk, an Italian immigrant who hailed from Calabria. The shop met the eggs, butter and simple cheese needs of the neighborhood. In the 1990s, Rob Kaufelt, a New Jersey native with a grocery background and a passion for cheese, purchased the business and expanded the offerings. Today the establishment is chockablock with cheeses that Kaufelt has discovered during his travels around the world. After our Murray's visit, the guide led us down the road a bit to another beloved New York institution--a small pizza shop by the name of Joe's. He informed us that lines are often "out the door," which isn't hard to believe since the shop can be described as "cozy." With its glutinous, thin crust made with dough incorporating New York City tap water, high-quality mozzarella, and San Marzano tomatoes, it sets the standard for what New York pizza is supposed to be and has won many accolades, including being named one of the "Best 25 Pizzas on Earth," by GQ Magazine. A bit of inside information provided by the guide: the little joint was originally located just three doors down, but at the end of the 20-year-lease, the rent skyrocketed from $900 a month to a whopping $15,000 a month. Joe wasn't having it, so he moved down the street and, at age 75, still oversees operations. 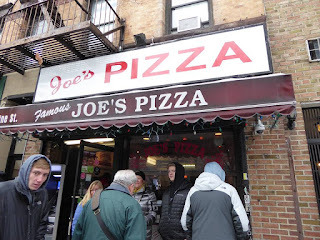 After snacking on our pizza slices, we learned a little more about the architecture and history of the area and that is it quite expensive to reside in "The Village." Our guide informed us that this tenement housing you see below located is considered a "steal" and is available for between $2600 and $3200 a month. (Evidently, my version of "steal" is quite different than that of a New Yorker.) 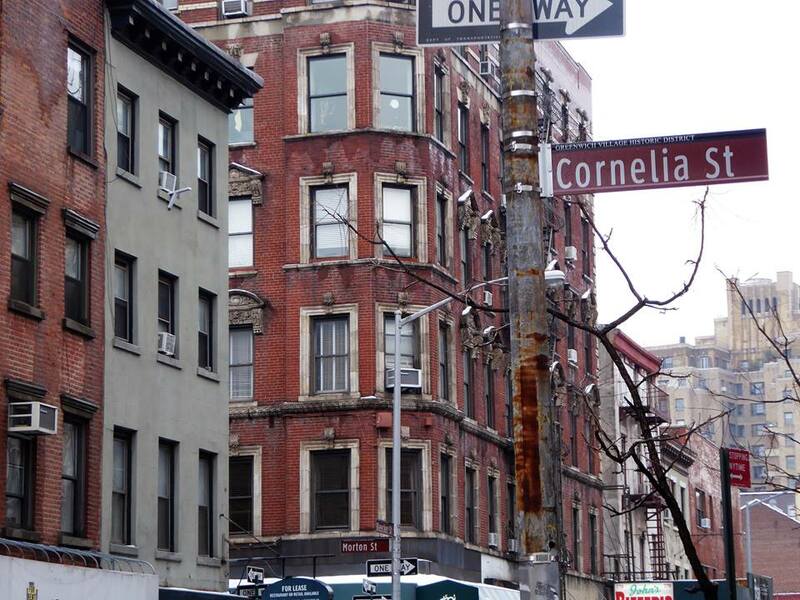 That princely sum will land you a studio apartment measuring between 300-350 square feet. Air conditioning, pets, elevators? Fugeddaboutit. 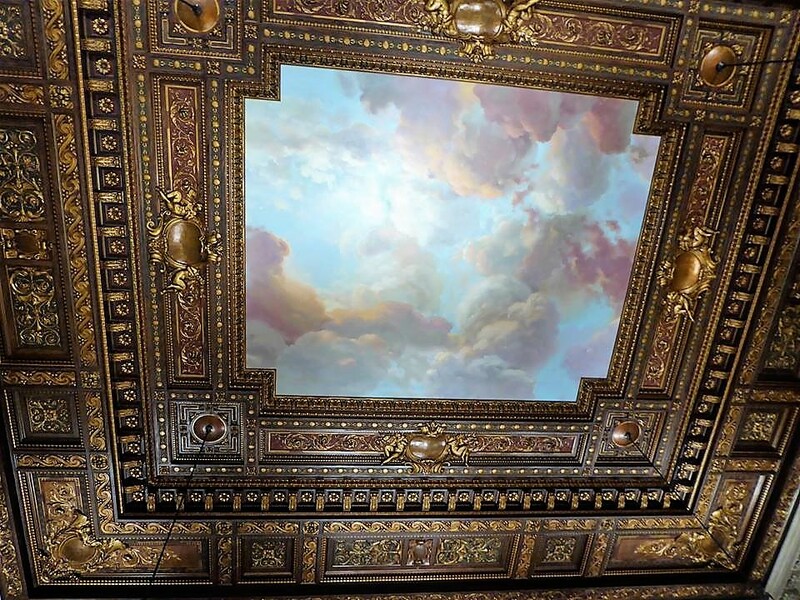 Dreaming of New York living? A studio apartment in this beauty cost between $2600-$3200 a month. Want to capture a glimpse of Taylor Swift? Word has it you can at least view her darkly tinted chariot emerging once in awhile. That's quite a contrast to a property that Taylor Swift is currently renting. 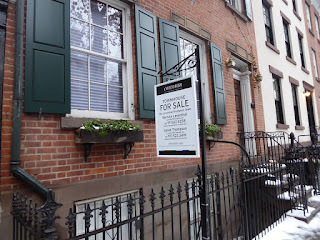 We happened upon this property on our way to Cornelia Street Cafe, which is located on the same block. Cornelia Street Cafe is well known in New York as an artistic haunt, featuring spoken word, comedy and musical performances. There we enjoyed a deep-fried, softball-sized rice ball known as arancini, Having been on other food tours, I have learned from experience to pace myself, so my husband was only too happy to indulge in half of what I was served during most of the tour. Cornelia Street Cafe dates back to the 1970s. 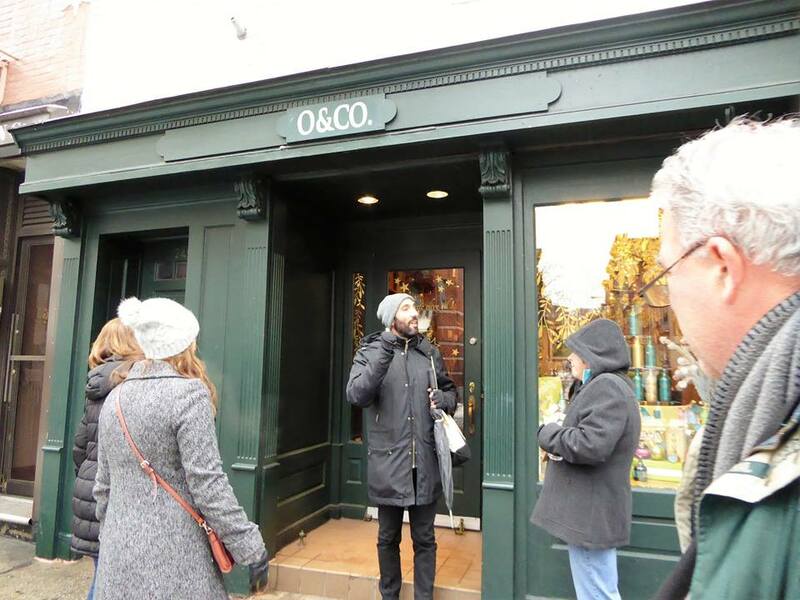 A stop at O & Co. revealed to the group why we're being ripped off by substandard olive oil and deceptive marketing practices. 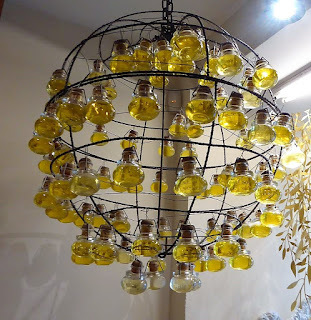 Having enjoyed the quality of olive oil sold at O & Co. in the past, I am happy they are getting the word out. Hint: Always look for "cold pressed." Heat processing destroys the health benefits. 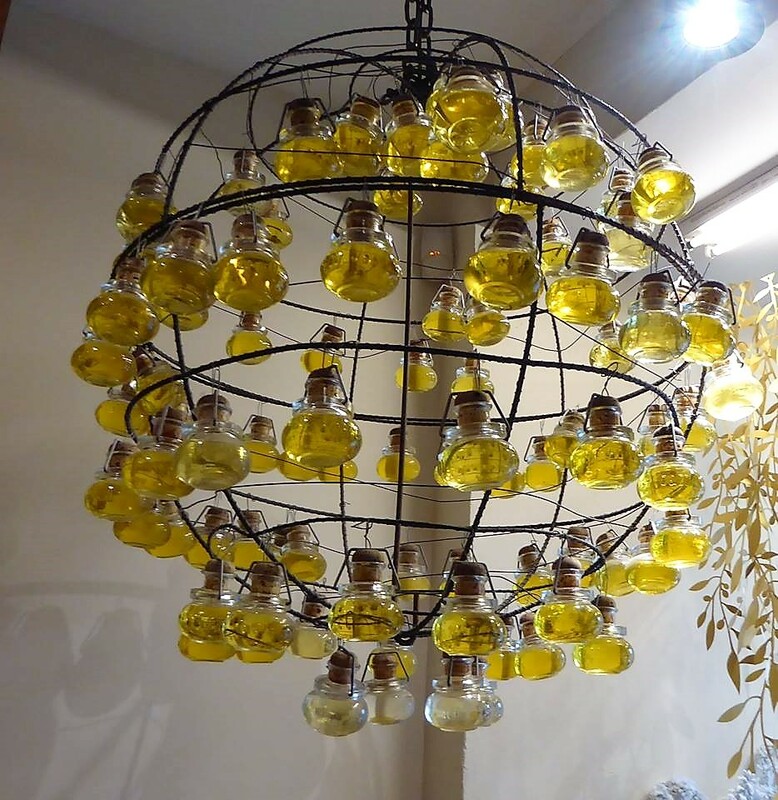 O & Co. sells a selection of high-quality olive oil and balsamic vinegar. 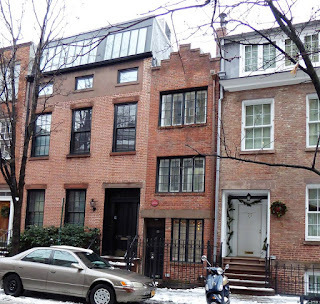 As we trudged along the slushy streets, our guide pointed out this interesting abode, known as the narrowest home in New York City. 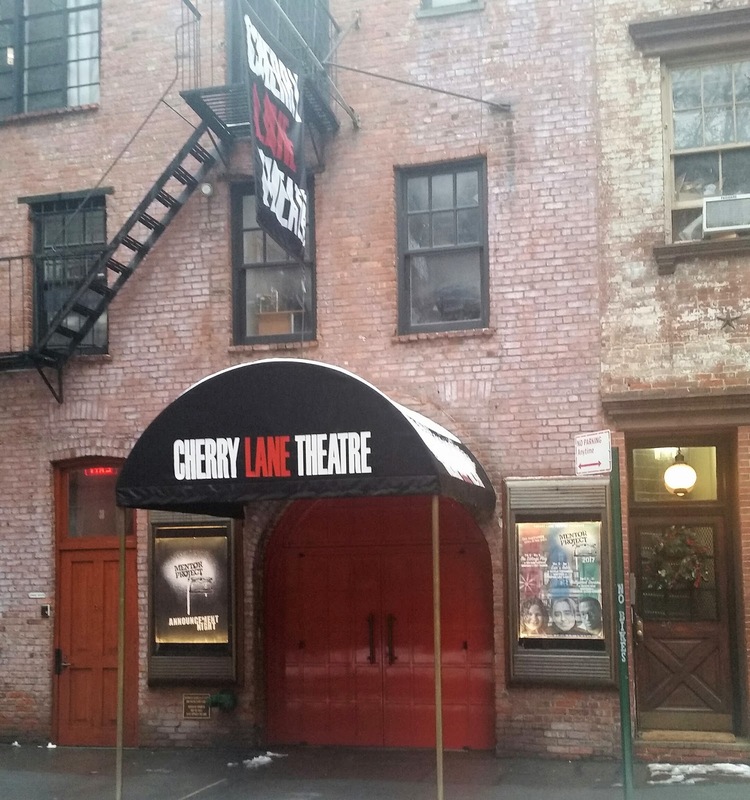 The dwelling once served as a boarding house for actors at the nearby Cherry Lane Theatre. 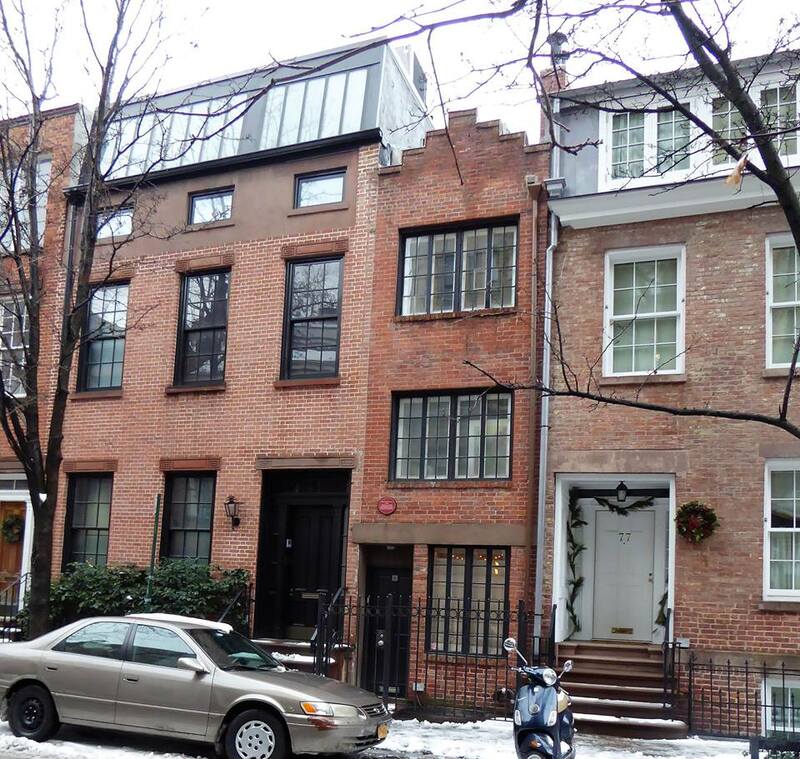 Once home to poet Edna St. Vincent Millay and anthropologist Margaret Mead, the 9 x 6-inch dwelling sold for a cool $3.25 million in 2013. 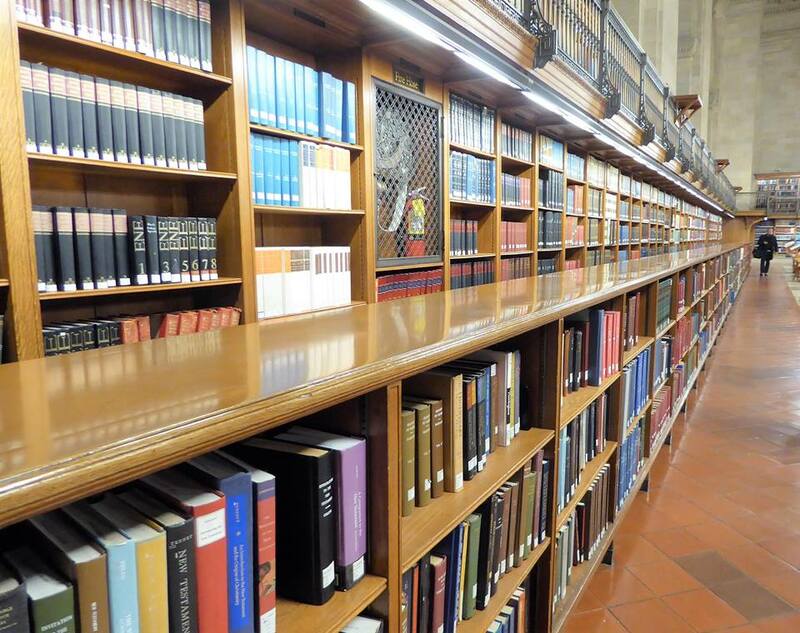 To get a glimpse inside this unique space, click here. 75 1/2 Bedford Street, New York. 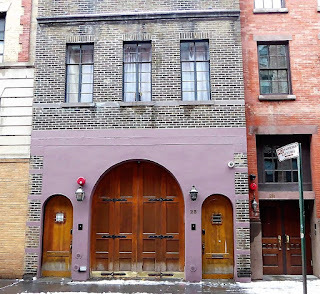 This address is known as the narrowest home in NYC. From there, we took a peek at the Cherry Lane Theater, where Barbra Streisand once worked as an usher. 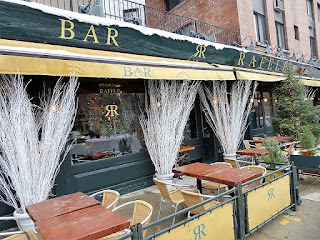 Other stops along the way included Trattoria Pesce Pasta, where we indulged in one of the delicious meatballs for which they are known and Rafele Ristorante, where we dined on eggplant rollatini. 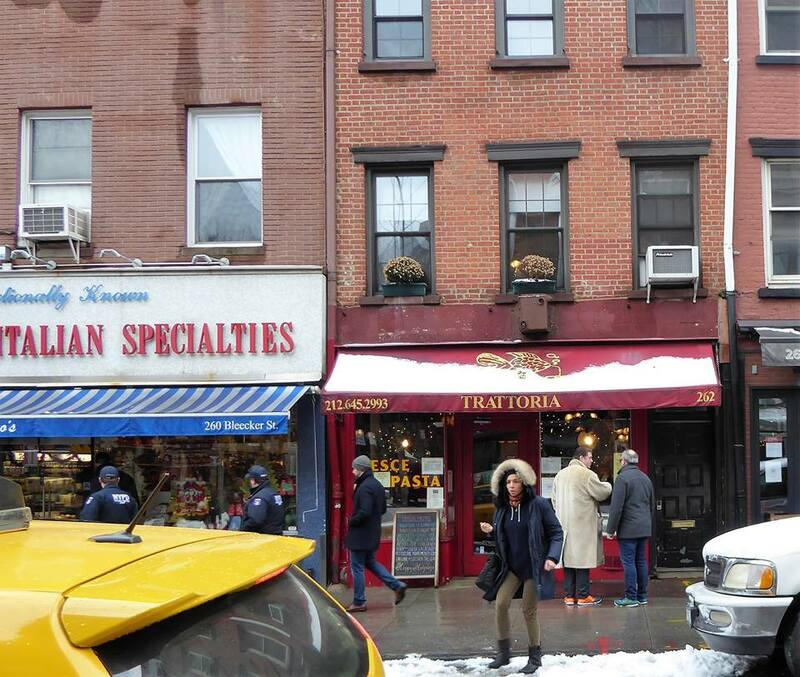 Trattoria Pesce Pasta opened in 1992 and is a neighborhood favorite. 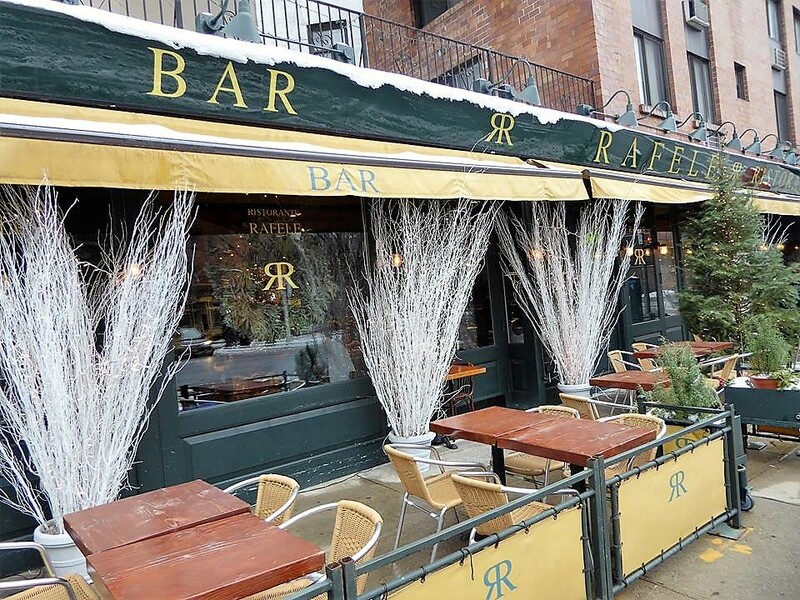 We dined on eggplant rollatini at Rafele Ristorante. 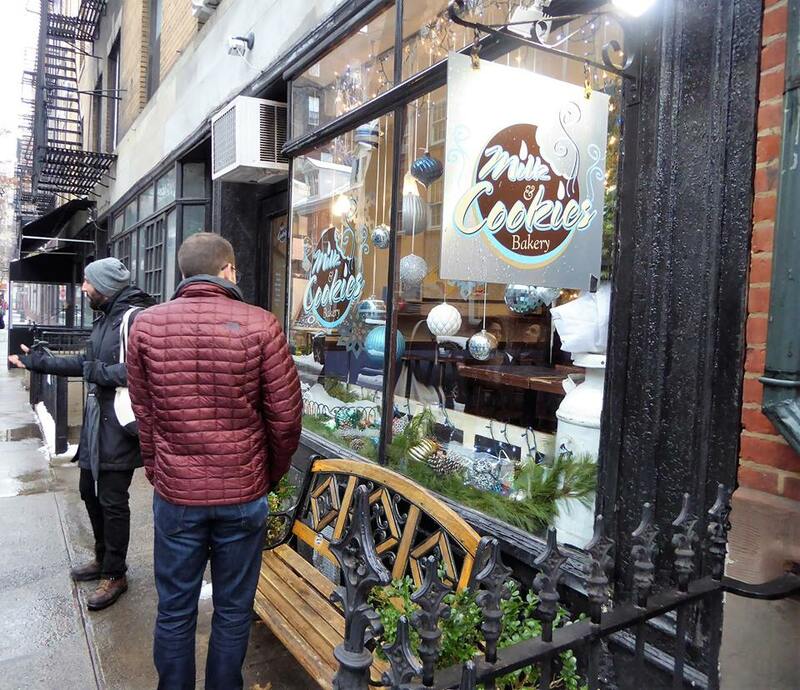 We ended our tour with an oversized chocolate chip cookie at Milk and Cookies Bakery, an independent neighborhood haunt that caters to Greenwich Village locals. 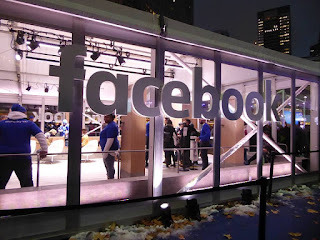 Our guide pointed out the property next door that was once rented by Mark Zuckerberg and is currently on the market for a mere $5.75 million. 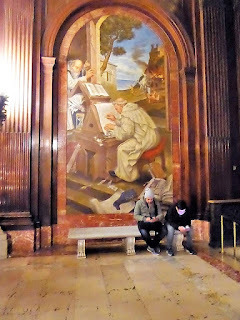 Before wrapping up our visit to New York, we managed to take in a few sights at Bryant Park and had the opportunity to meet a few rude employees at the New York Public Library who loudly shouted, "Get OUT, Get OUT," to a gang of people at 5:45 p.m. near closing time. Well, I guess they aren't known as the "City of Brotherly Love," so what can one expect? 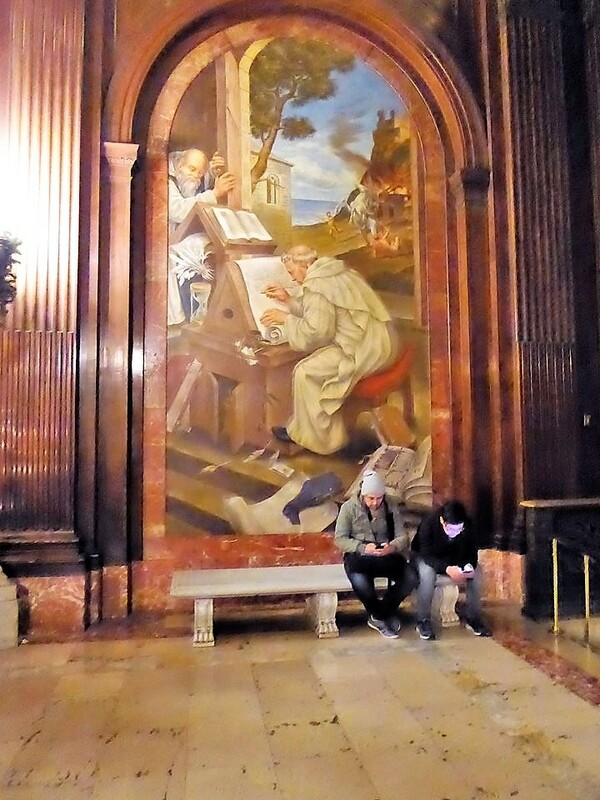 A mural at the New York Public Library. Holdings at the New York Public Library. 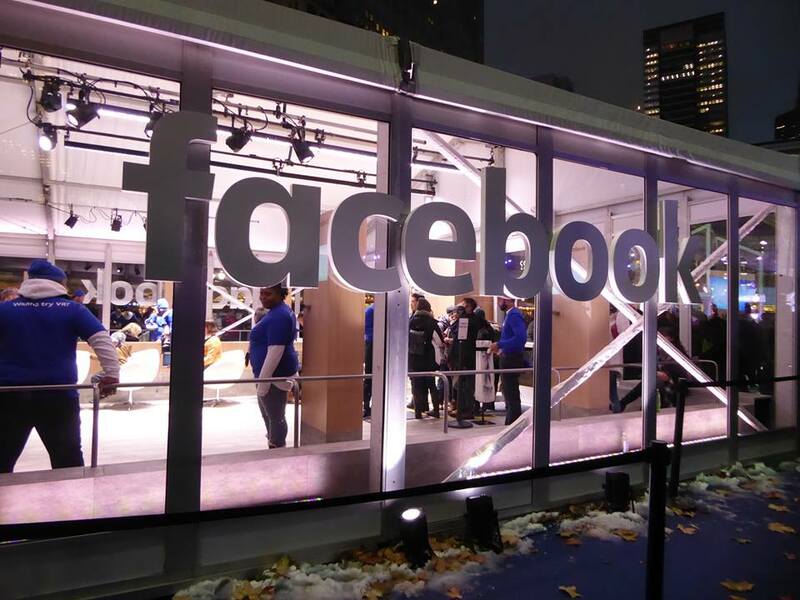 FaceBook was demonstrating VR at a pop up in Bryant Park. 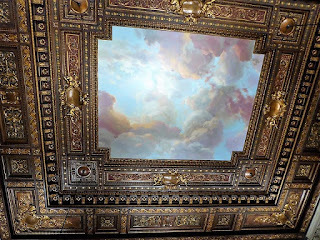 A shot of the New York Public Library ceiling. 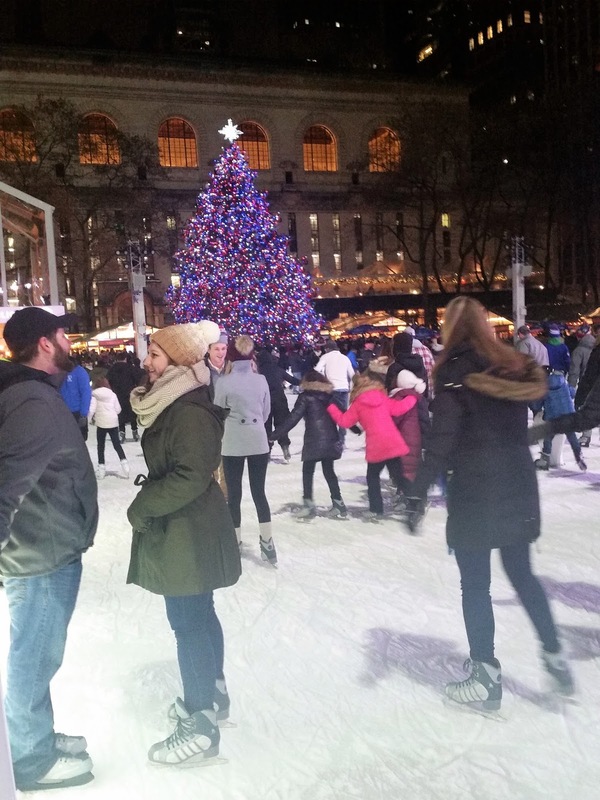 Ice skaters at Bryant Park. Still, NY remains extremely popular during the holiday season and the streets grew claustrophobically crowded as dusk fell. 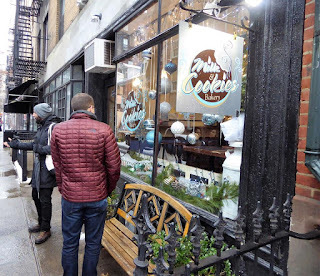 I'd be interested in taking another food tour when the weather is a bit more accommodating and the crowds a little less intense, but if you enjoy food, history, architecture and local lore, it's certainly time well spent.